It's time for a new project...most of my looms are empty and I am getting over that feeling of loss that I get when I have finished a big project. I will post a picture of my finished tapestry called Window to the Sierras after the conference in March. Don't want to ruin the surprise for those special folks who have signed up for the Visalia ASCH conference. Now it's time to see what my new sixteen harness loom can do. One reason I bought it was to get better definition and have more freedom than with the eight harness in designing patterns. I am going to make a bookmark with a similar setup as the ones I have done previously just making those changes which occur due to twice as many harnesses. 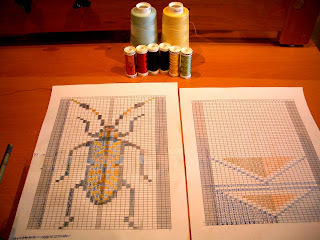 So here is my first draft of the new beetle pattern I designed, it's a Aristobia beetle from Thailand. I also expanded the double diamond pattern I was putting on the top and bottom of the bookmarks I woven last year. Rule one with taquete weaving...make sure you have enough heddles on your tie up shafts before warping. I need 62 heddles on shaft 1 and 16 if I want to make bookmark...but since I want to make two...one for me and one for you...I have to go order some more.